26,000 were put behind bar-wire in Tule Lake. 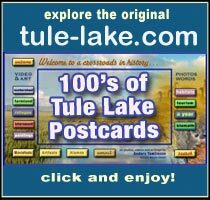 Many internees to want to mention Tule Lake, it leaves a bad taste in their mouths. 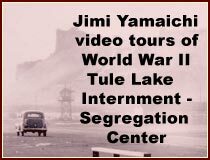 Jimi Yamaichi recounts that over 120,000 japanese-Americans were interned and 26,000 of them were at Tule Lake Internment and Tule Lake Segregation Centers at one time or another. 14,000 to 15,000 internees were in camp before Segregation. 4,000 to 5,000 of these answered no-no on the loyalty oath, the most of any camp. The Government intended Poston, Arizona to became the Segregation facility for ” No – No’s.” Since Tule Lake had so many “No-No”, 10,000 “Yes-Yes” were moved out of camp and upwards of 15,000 “No -No” arrived from other camps. This brought the maximum Tule Lake internment at any given time to 18,700. In the Summer of 1944 10 more blocks were added, mainly for Manzanar bachelors. Camp entrances before and after Segregation. Jimi Yamaichi recalls the life after Tule Lake becoming a Segregation Center. There had been talk of using the camp to house 15,000 Communists. The last ten blocks of barracks mainly housed Internees from Manzanar Internment Center and men from a Justice Camp in Hawaii. Family members in the USA would reunite with the men from Hawaii at the Tule Lake Segregation Center. Jimi Yamaichi recalls that Tule Lake was thought to be the most self-sustaining of all the camps. It had 3,800 acres of cultivated rich farmland, chicken and hog farms, large packing house to process food, pumps, wells and sewers systems. All of the camps had closed in the Fall of 1945 while Tule Lake remained open until March 20th, 1946. Tule Lake Internment – Segregation Centercenter was torn down in 1947 and 1948. There had been talk of using the camp to house 15,000 Communist party members.